Examples of drag include the component of the net aerodynamic or hydrodynamic force acting opposite to the direction of movement of a solid object such as cars, aircraft and boat hulls; or acting in the same geographical direction of motion as the solid, as for sails attached to a down wind sail boat, or in intermediate directions on a sail depending on points of sail. In the case of viscous drag of fluid in a pipe, drag force on the immobile pipe decreases fluid velocity relative to the pipe. In the physics of sports, the drag force is necessary to explain the performance of runners, particularly of sprinters. The phrase parasitic drag is mainly used in aerodynamics, since for lifting wings, drag is generally small compared to lift. For flow around bluff bodies, form and interference drags often dominate, and then the qualifier "parasitic" is meaningless. Further, lift-induced drag is only relevant when wings or a lifting body are present, and is therefore usually discussed either in aviation or in the design of semi-planing or planing hulls. Wave drag occurs either when a solid object is moving through a fluid at or near the speed of sound or when a solid object is moving along a fluid boundary, as in surface waves. for the case of a sphere. Since the power needed to overcome the drag force is the product of the force times speed, the power needed to overcome drag will vary as the square of the speed at low Reynolds numbers and as the cube of the speed at high numbers. is the Reynold Number related to fluid path length L.
The reference area A is often orthographic projection of the object (frontal area)—on a plane perpendicular to the direction of motion—e.g. for objects with a simple shape, such as a sphere, this is the cross sectional area. Sometimes a body is a composite of different parts, each with a different reference areas, in which case a drag coefficient corresponding to each of those different areas must be determined. In the case of a wing the reference areas are the same and the drag force is in the same ratio to the lift force as the ratio of drag coefficient to lift coefficient. Therefore, the reference for a wing is often the lifting area ("wing area") rather than the frontal area. For an object with a smooth surface, and non-fixed separation points—like a sphere or circular cylinder—the drag coefficient may vary with Reynolds number Re, even up to very high values (Re of the order 107). For an object with well-defined fixed separation points, like a circular disk with its plane normal to the flow direction, the drag coefficient is constant for Re > 3,500. 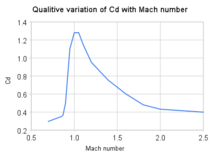 Further the drag coefficient Cd is, in general, a function of the orientation of the flow with respect to the object (apart from symmetrical objects like a sphere). Note that the power needed to push an object through a fluid increases as the cube of the velocity. A car cruising on a highway at 50 mph (80 km/h) may require only 10 horsepower (7.5 kW) to overcome aerodynamic drag, but that same car at 100 mph (160 km/h) requires 80 hp (60 kW). With a doubling of speed the drag (force) quadruples per the formula. Exerting 4 times the force over a fixed distance produces 4 times as much work. At twice the speed the work (resulting in displacement over a fixed distance) is done twice as fast. Since power is the rate of doing work, 4 times the work done in half the time requires 8 times the power. is the object speed (both relative to ground). ~ 9 m/s, and so on. Terminal velocity for very small objects (pollen, etc.) at low Reynolds numbers is determined by Stokes law. , heavier objects fall more quickly. of 10 µm/s. Using 10−3 Pa·s as the dynamic viscosity of water in SI units, we find a drag force of 0.09 pN. This is about the drag force that a bacterium experiences as it swims through water.
. Alternatively, calculated from the flowfield perspective (far-field approach), the drag force results from three natural phenomena: shock waves, vortex sheet, and viscosity. , due to pressure distribution acting on the body. The nature of these normal forces combines shock wave effects, vortex system generation effects, and wake viscous mechanisms. The viscosity of the fluid has a major effect on drag. In the absence of viscosity, the pressure forces acting to retard the vehicle are canceled by a pressure force further aft that acts to push the vehicle forward; this is called pressure recovery and the result is that the drag is zero. That is to say, the work the body does on the airflow, is reversible and is recovered as there are no frictional effects to convert the flow energy into heat. Pressure recovery acts even in the case of viscous flow. Viscosity, however results in pressure drag and it is the dominant component of drag in the case of vehicles with regions of separated flow, in which the pressure recovery is fairly ineffective. , is calculated as the downstream projection of the viscous forces evaluated over the body's surface. use entropy changes to accurately predict the drag force. , results from shock waves in transonic and supersonic flight speeds. The shock waves induce changes in the boundary layer and pressure distribution over the body surface. The idea that a moving body passing through air or another fluid encounters resistance had been known since the time of Aristotle. Louis Charles Breguet's paper of 1922 began efforts to reduce drag by streamlining. Breguet went on to put his ideas into practice by designing several record-breaking aircraft in the 1920s and 1930s. Ludwig Prandtl's boundary layer theory in the 1920s provided the impetus to minimise skin friction. A further major call for streamlining was made by Sir Melvill Jones who provided the theoretical concepts to demonstrate emphatically the importance of streamlining in aircraft design. In 1929 his paper ‘The Streamline Airplane’ presented to the Royal Aeronautical Society was seminal. He proposed an ideal aircraft that would have minimal drag which led to the concepts of a 'clean' monoplane and retractable undercarriage. The aspect of Jones's paper that most shocked the designers of the time was his plot of the horse power required versus velocity, for an actual and an ideal plane. By looking at a data point for a given aircraft and extrapolating it horizontally to the ideal curve, the velocity gain for the same power can be seen. When Jones finished his presentation, a member of the audience described the results as being of the same level of importance as the Carnot cycle in thermodynamics. Lift-induced drag (also called induced drag) is drag which occurs as the result of the creation of lift on a three-dimensional lifting body, such as the wing or fuselage of an airplane. Induced drag consists primarily of two components: drag due to the creation of trailing vortices (vortex drag); and the presence of additional viscous drag (lift-induced viscous drag) that is not present when lift is zero. The trailing vortices in the flow-field, present in the wake of a lifting body, derive from the turbulent mixing of air from above and below the body which flows in slightly different directions as a consequence of creation of lift. With other parameters remaining the same, as the lift generated by a body increases, so does the lift-induced drag. 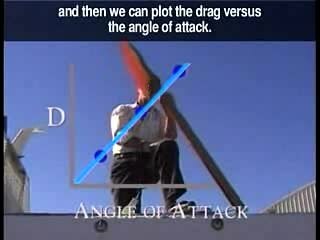 This means that as the wing's angle of attack increases (up to a maximum called the stalling angle), the lift coefficient also increases, and so too does the lift-induced drag. At the onset of stall, lift is abruptly decreased, as is lift-induced drag, but viscous pressure drag, a component of parasite drag, increases due to the formation of turbulent unattached flow in the wake behind the body. Parasitic drag is drag caused by moving a solid object through a fluid. Parasitic drag is made up of multiple components including viscous pressure drag (form drag), and drag due to surface roughness (skin friction drag). Additionally, the presence of multiple bodies in relative proximity may incur so called interference drag, which is sometimes described as a component of parasitic drag. In aviation, induced drag tends to be greater at lower speeds because a high angle of attack is required to maintain lift, creating more drag. However, as speed increases the angle of attack can be reduced and the induced drag decreases. Parasitic drag, however, increases because the fluid is flowing more quickly around protruding objects increasing friction or drag. At even higher speeds (transonic), wave drag enters the picture. Each of these forms of drag changes in proportion to the others based on speed. 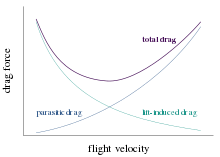 The combined overall drag curve therefore shows a minimum at some airspeed - an aircraft flying at this speed will be at or close to its optimal efficiency. Pilots will use this speed to maximize endurance (minimum fuel consumption), or maximize gliding range in the event of an engine failure. Wave drag (also called compressibility drag) is drag that is created when a body moves in a compressible fluid and at speeds that are close to the speed of sound in that fluid. In aerodynamics, wave drag consists of multiple components depending on the speed regime of the flight. In transonic flight (Mach numbers greater than about 0.8 and less than about 1.4), wave drag is the result of the formation of shockwaves in the fluid, formed when local areas of supersonic (Mach number greater than 1.0) flow are created. In practice, supersonic flow occurs on bodies traveling well below the speed of sound, as the local speed of air increases as it accelerates over the body to speeds above Mach 1.0. However, full supersonic flow over the vehicle will not develop until well past Mach 1.0. Aircraft flying at transonic speed often incur wave drag through the normal course of operation. In transonic flight, wave drag is commonly referred to as transonic compressibility drag. Transonic compressibility drag increases significantly as the speed of flight increases towards Mach 1.0, dominating other forms of drag at those speeds. In supersonic flight (Mach numbers greater than 1.0), wave drag is the result of shockwaves present in the fluid and attached to the body, typically oblique shockwaves formed at the leading and trailing edges of the body. In highly supersonic flows, or in bodies with turning angles sufficiently large, unattached shockwaves, or bow waves will instead form. Additionally, local areas of transonic flow behind the initial shockwave may occur at lower supersonic speeds, and can lead to the development of additional, smaller shockwaves present on the surfaces of other lifting bodies, similar to those found in transonic flows. In supersonic flow regimes, wave drag is commonly separated into two components, supersonic lift-dependent wave drag and supersonic volume-dependent wave drag. ^ "Definition of DRAG". www.merriam-webster.com. ^ a b "What is Drag?". ^ G. Falkovich (2011). Fluid Mechanics (A short course for physicists). Cambridge University Press. ISBN 978-1-107-00575-4. ^ Eiffel, Gustave (1913). The Resistance of The Air and Aviation. London: Constable &Co Ltd.
^ Marchaj, C. A. (2003). Sail performance : techniques to maximise sail power (Rev. ed.). London: Adlard Coles Nautical. pp. 147 figure 127 lift vs drag polar curves. ISBN 978-0-7136-6407-2. ^ Drayton, Fabio Fossati ; translated by Martyn (2009). Aero-hydrodynamics and the performance of sailing yachts : the science behind sailing yachts and their design. Camden, Maine: International Marine /McGraw-Hill. pp. 98 Fig 5.17 Chapter five Sailing Boat Aerodynamics. ISBN 978-0-07-162910-2. ^ "Calculating Viscous Flow: Velocity Profiles in Rivers and Pipes" (PDF). Retrieved 16 October 2011. ^ "Viscous Drag Forces". Retrieved 16 October 2011. ^ Hernandez-Gomez, J J; Marquina, V; Gomez, R W (25 July 2013). "On the performance of Usain Bolt in the 100 m sprint". Eur. J. Phys. 34 (5): 1227. arXiv:1305.3947. Bibcode:2013EJPh...34.1227H. doi:10.1088/0143-0807/34/5/1227. Retrieved 23 April 2016. ^ Note that for Earth's atmosphere, the air density can be found using the barometric formula. It is 1.293 kg/m3 at 0 °C and 1 atmosphere. ^ Size effects on drag, from NASA Glenn Research Center. ^ Wing geometry definitions, from NASA Glenn Research Center. ^ Roshko, Anatol (1961). "Experiments on the flow past a circular cylinder at very high Reynolds number" (PDF). Journal of Fluid Mechanics. 10 (3): 345–356. Bibcode:1961JFM....10..345R. doi:10.1017/S0022112061000950. ^ a b Batchelor (1967), p. 341. ^ Brian Beckman (1991). "Part 6: Speed and Horsepower". Retrieved 18 May 2016. ^ Haldane, J.B.S., "On Being the Right Size"
^ Collinson, Chris; Roper, Tom (1995). Particle Mechanics. Butterworth-Heinemann. p. 30. ISBN 9780080928593. ^ a b Anderson, John David (1929). A History of Aerodynamics: And Its Impact On Flying Machines. University of Cambridge. ^ a b "University of Cambridge Engineering Department". Retrieved 28 Jan 2014. ^ Sir Morien Morgan, Sir Arnold Hall (November 1977). Biographical Memoirs of Fellows of the Royal Society Bennett Melvill Jones. 28 January 1887 -- 31 October 1975. Vol. 23. The Royal Society. pp. 252–282. ^ Mair, W.A. (1976). Oxford Dictionary of National Biography. ^ a b c Batchelor (2000), pp. 337–343. Anderson, John D. Jr. (2000); Introduction to Flight, Fourth Edition, McGraw Hill Higher Education, Boston, Massachusetts, USA. 8th ed. 2015, ISBN 978-0078027673.